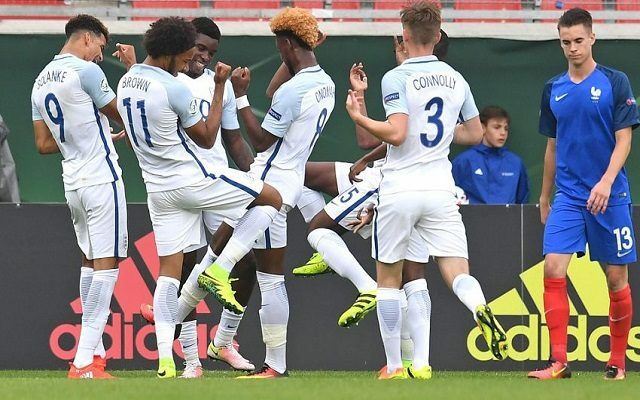 Sheyi Ojo supplied the assists for both England’s goals as they beat France 2-1 in the U19s European Championship opener at the Voith Arena in Heidenheim an der Brenz. England’s two goals both arrived inside the first ten minutes. The first was an own goal, as Clement Michelin turned Ojo’s cross into his own net. The second was scored by Chelsea’s Dominic Solanke after he neatly tucked away an inch-perfect through ball from our man. Jean-Kevin Augustin pulled one back from the French after half an hour, but Aidy Boothroyd’s team held on. Ojo was withdrawn after 65 minutes, presumably with one eye on the game against the Netherlands on Friday. England close out the group stage with a match against Croatia next Monday. The top two from the group will progress to the semis of the eight-team competition.